Place the butter in a bowl and stir until creamy. Add the syrup and continue stirring until mixed. Add the icing sugar gradually until the mixture thickens. Transfer the mixture onto a board, and knead in more sugar until the mixture thickens like toffee - depending on the weather. Knead until the icing becomes very smooth. When ready for use, the mixture should not stick to your hands. Rolled buttercream will keep for months if regrigerated in a tightly sealed container. Bring to room temperature before using. Place a heavy crumb coat on the cake, with a minimum of filling between the layers. Roll out icing between two sheets of heavy plastic film to the desired size and shape. Peel the top piece of plastic off, turn it over and place on cake, peeling the second piece off gently, and smoothing icing using a hot spatula. 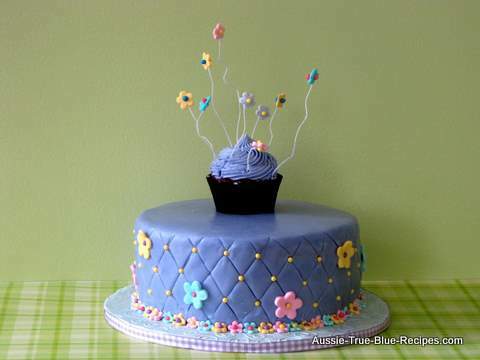 Add enough icing sugar to make a very firm consistency, then use this to mould simple shapes such as fruits, animals etc. Dust the mould lightly first with cornflour (or potato flour). If the mixture is soft, place it in the refrigerator to firm, then mould. If you live in a very hot or humid place, add a few pinches of Tylopur powder and knead through the mixture. This will assist in drying of the figures.